An important thing to consider when visiting your preferred service provider, or while you are looking for a new one, is how that particular shop conducts inspections. In the past, when vehicle technology was simpler, most inspections could be easily done by sight and without the need to remove components to access important areas of the vehicle. A visual inspection may not include the removal of parts necessary to access all the components that should be checked to ensure the mechanical fitness of your vehicle. For example, it is easy to conduct a visual battery inspection on an old car because the battery is immediately accessible when you remove the hood. However, on modern cars, the battery is often buried under other parts and a visual inspection is more laborious. Visual inspections are often used to recommend a full inspection, and keep in mind that courtesy (free) inspections are often visual. When you take your vehicle in for a seasonal check this summer, you need to understand what is being inspected and how. Continuing with our battery example, you need to know whether or not your battery is being inspected; this may depend on the ease of accessibility of your battery. Many shops will require your approval for checking a battery if it is inaccessible, because of additional costs. To make sure you know exactly what is being inspected on your vehicle, it is a good idea to ask your service provider to use a documented checklist. You will then receive a copy of this checklist with your invoice. This process ensures that the shop, the technician, and you are all on the same page about the work that was done, and are accountable for any omissions. When having specific and important components checked, such as brakes, you need to know whether you are receiving a visual inspection or a “tear down” inspection. For brakes, a visual inspection would involve the technician looking through the wheel to examine the brake pads and rotors. During a “tear down” inspection, the technician will actually remove the wheels, caliper brackets, and brake pads so that they can actually measure the thickness of the pads and rotors. From this example, it is easy to see which is better. 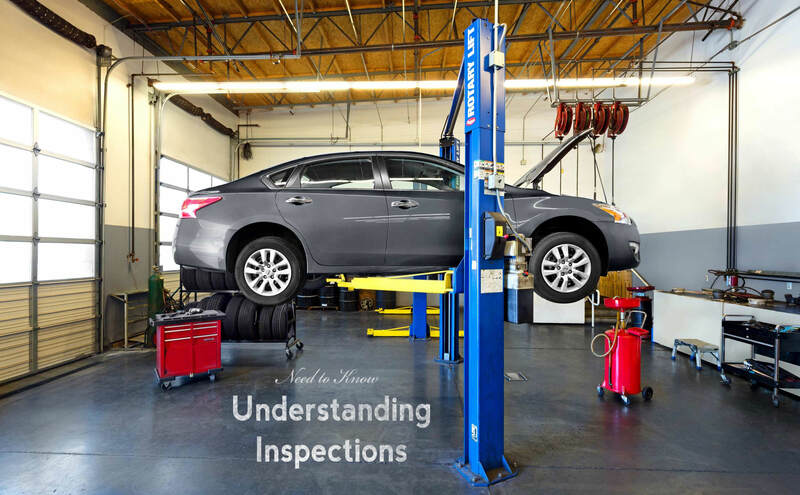 A visual inspection may start out free, but end up with the technician recommending a full inspection to accurately assess the condition of your vehicle. Although shops usually charge a fee for full inspections, you will receive a report showing all items inspected, as well as a written estimate that distinguishes between work that needs to be done and work that the technician suggests should be done. With the information provided by a full inspection, you can make an informed decision about what to do next, and avoid the uncertainty that accompanies a visual inspection. Read more about how we do inspections right here, and when you are ready, just give us a shout to make an appointment!